GENERAL DWIGHT D. EISENHOWER 1952 Detroit Flag Day Parade photo picture print photographs for sale. This sepia toned GENERAL DWIGHT D. EISENHOWER 1952 Detroit Flag Day Parade photo print for sale is made from a professionally restored original 1952 vintage black and white 'wirephoto' of this historic event. 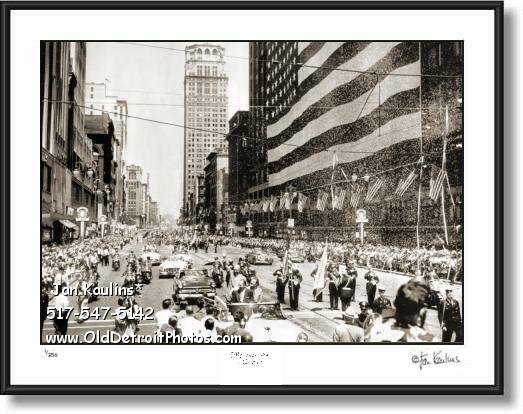 General Eisenhower in the center of the photo in the white car waves to the crowds with outstrectched arm as the June 14 Flag Day Parade makes its way slowly down Woodward Avenue. Throngs came out to see the famous General from WWII and lined Woodward Avenue in front of the World's Largest Flag displayed on the front of the landmark JL Hudson's Department Store in downtown Detroit. The sky and the streets are filled with confetti and paper being thrown from windows above the parade. At City Hall over 40,000 persons stood in the hot sun and repeated the Pledge of Allegiance with General Dwight D. Eisenhower. In the background we can see the tall Broderick Tower skyscraper. This image is taken from a 'wire photo' which varies from a photo made from a negative in that it was transferred, using the technology of that era, via 'wire'. The quality of the image is good, but on the largest size prints you can see the tiny horizontal lines on the image itself. This is just mentioned for the sake of accuracy. The image itself is rare enough that it is included in the historical Detroit Photo series here. Eisenhower, shown here in this historic Detroit photograph from 1952, was just beginning his run for the Presidency of the United States, which he handily won the following year in 1953. He served two terms in office, retiring in 1961. This is an extremely rare and unique image of General Eisenhower cruising down Woodward Avenue as thousands cheer! Ike, as he was fondly called by friends and admirers, had been a 5 Star Army General during WWII and had been the Supreme Commander of Allied Forces in Europe during that conflict. He was soon to be President. THESE BLACK AND WHITE DETROIT PHOTO ART PRINTS ARE VERY HIGH QUALITY PROFESSIONALLY RESTORED REPRODUCTIONS OF ORIGINAL OLD VINTAGE HISTORICAL DETROIT PHOTOGRAPHIC NEGATIVE/PRINTS. THESE SEPIA TONED BLACK AND WHITE DETROIT PHOTOS ARE OFFERED FOR SALE HERE FOR THE VERY FIRST TIME. THEY HAVE BEEN MADE FROM ORIGINAL NEGATIVES OR ORIGINAL FIRST GENERATION PRINTS, MANY OF THEM ARE 50 YEARS OLD AND SOME DATE TO THE EARLY 1920's AND 1930's. THE RARE OLD DETROIT ORIGINAL PHOTOS AND BLACK AND WHITE NEGATIVES USED FOR THESE PRINTS HAVE BEEN OBTAINED FROM HISTORICAL SOCIETIES, NATIONAL ARCHIVES, THE LIBRARY OF CONGRESS AND NUMEROUS PRIVATE COLLECTIONS. IT HAS TAKEN SEVERAL YEARS TO PUT THESE OFFERINGS TOGETHER ON THIS WEBSITE. MANY OF THESE PHOTOS ORIGINALLY CAME FROM OLD DEFUNCT NEWSPAPER AND MAGAZINE ARCHIVES, WHERE THEY WERE USED ONCE FOR A STORY AND THEN USUALLY JUST THIS ONE ORIGINAL PRINT WAS MADE AND KEPT FOR THEIR ARCHIVES. HENCE, THESE HISTORICAL IMAGES WERE NOT ORIGINALLY MADE TO BE FOR SALE, BUT WERE TO BE USED AS IMAGES FOR NEWS STORIES AS THEY UNFOLDED--MAKING THESE IMAGES EXTREMELY RARE HAVING SURVIVED SO MANY YEARS. VERY FEW OF THESE IMAGES HAVE EVER BEEN OFFERED FOR SALE TO THE PUBLIC UNTIL NOW. THE ORIGINAL OLD DETROIT BLACK AND WHITE PHOTOGRAPHS HAVE BEEN PROFESSIONALLY RESTOED DIGITALLY BEEN RE-MASTERED AND ALL MAJOR FLAWS, SUCH AS TEARS, SRACTCHES, MISSING PIECES, FOLDS, INK STAINS ETC. ON THESE RARE PHOTOS HAVE BEEN PAINSTAKINGLY REMOVED AND CORRECTED AND HIGH QUALITY PRINTS OF THESE HISTORIC RARE DETROIT BLACK AND WHITE SEPIA TONED PHOTOS ARE NOW OFFERED, FOR THE FIRST TIME, ON THIS WEBSITE WWW.OldDetroitPhotos.COM . THESE PHOTOS HAVE BEEN BEAUTIFUL RESTORED AND ARTISTICALLY SEPIA TONED AND OFFERED IN A LIMITED EDITION OF INDIVIDUALLY PRINTED PHOTO PRINTS. THEY ARE READY FOR DISPLAY IN YOUR HOME OR OFFICE. HERE IS YOUR CHANCE TO OWN AND ENJOY SOME VERY SPECIAL AND UNIQUE DETROIT HISTORY.